The past three weeks have been perhaps the most stressful and yet biggest opportunity for growth I’ve ever had in my life. On Easter Sunday, I was t-boned. It was one of those moments in life where everything slows down, as if watching a movie in slow motion, and yet at the same time, it all happened so fast, I don’t even remember the airbags going off. After the car spun and finally came to a stop, I knew two things: 1. My car was totaled (I knew it even without seeing the damage) and 2. I knew this was absolutely not my fault and I was accepting nothing less than that. After I managed to crawl out the passenger side of my car (in a short dress and heels no less – it was Easter after all) shock set in as anger, panic, and fear began to try and take root. What if I had gone to church that Sunday with my parents instead of attending my church first? What if I hadn’t gone back inside my church to talk to someone afterwards, delaying me just a few moments more? What if I had taken a different route? I was drowning fast in the quicksand of ‘what-ifs’. I’m sure my mother saw the panic setting in as I began to slowly meltdown sitting in the speaker’s room at church. But her kind words brought me back (even if it was just a little bit back) – “Forgive him. Walk in forgiveness. Walk in love.” (Although she admitted later she was having just as hard of a time doing the exact same thing – and she wasn’t even in the car with me). I can not even count how many times I have repeated this to myself over the past three weeks. Sometimes just in my head. Sometimes under my breath. Sometimes nearly screaming it at myself. But none-the-less, I have confessed it nearly every day. But, just because God is working on you, doesn’t mean satan still doesn’t try to take that joy away. It wasn’t too many more minutes after that when the worry began to creep in. What am I going to do? How am I going to afford another car? How am I even going to get to work tomorrow? (Yup, that’s me – the practical one). Over the next few days I began to have a new revelation of worry, regret, and resting in God. You see – the more “what-if” thoughts I entertained, the more I began to see regret and worry try to take over. “What-ifs” over decisions already made, is nothing but REGRET. And “what-ifs” about future decision, not yet made, is nothing but WORRY. But what does the Word say about this all? Cast your cares over on to God for He cares for you! (1 Peter 5:7). And if God cares so much for the smallest of creatures in His creation, how much more so does He care for you?! He will provide for you so don’t let worry take over! (Matthew 6). I began to realize that not only was I drowning in the “what-if” quicksand of regrets, but I was already putting stock in “what-if” worry that hadn’t even happened yet. “What if I meet someone tomorrow, get married, and have a baby – I’d need a bigger, more practical vehicle?”, “What if my finances don’t continue to improve and I’m stuck with a car payment?”, “What if the insurance company offers me pennies on the dollar value for my car?”….what if, what if, what if. And that’s when it really hit me…I wasn’t just living this moment in the “what-ifs”, I had been living the last 12yrs of my life based on “what-ifs”! I’ve been living my life putting more faith in fear of the unknown than putting faith in God, the known! 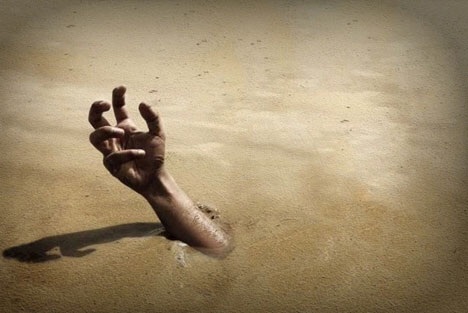 There’s only one thing that can pull you out of this downward spiral of drowning in what-if quicksand – God. This is where you have to cast those cares over on to Him. You have to trust that He loves you so much, He will take care of you and won’t let you want for anything. This is where you have to say enough is enough – I won’t put faith in worry anymore. I won’t live a life paralyzed by “what-ifs”. We’re now 3 weeks out from the accident. Praise God I’m getting better every day, less sore, and I’m learning to put faith in Him instead of in the “what-ifs”. Praise God for His over and above blessings and a great testimony and lesson from this all. Do I have it all figured out yet? Of course not. But God does and His plan is far superior to mine! I’m ready to use His word as a bridge over this quicksand of “what-if”, worry and regret, and move forward in to the blessing He has waiting for me! This has been an interesting week here in Texas to say the least. And quite possibly one of the longest weeks I can remember. 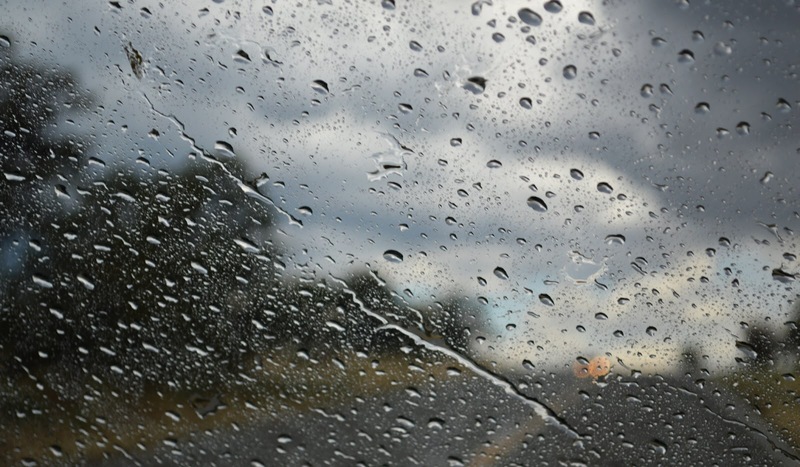 Sunday brought freezing rain that we were driving home in. Monday was more ice and a crazy, hectic day at work. Tuesday was mostly the remnants of Monday. But, oh, Wednesday brought some hope! Wednesday morning started off with a snow covered car and gray, gloomy skies. But by lunch time, just four short hours later, there wasn’t a single sign of snow left and beautiful blue skies had emerged! As I was sitting there on my lunch break, I started thinking about what I had written the week before about staying focused on the future that’s ahead of you and not getting side tracked on what’s currently happening around you. But God took this one step further with me, when I started thinking of how quickly our circumstances can change for the better. In a matter of just four hours, or 240 minutes, the weather here in “bi-polar Texas” changed from freezing, gloomy, with snow to cool, sunny, and clear blue skies. If the weather can change that quickly, how quickly can our circumstances change when God is involved? Given God’s track record, I’d say quicker than the speed of light. When God was creating the world, and the world was without light, God spoke change into the void and light was. God didn’t speak it and then several days later, after a bunch of other things happened and fell in to place, light finally happened. God didn’t speak it and light only showed up in one place, but not another. No. God spoke “let there be light and light was!” (Genesis 1). I started thinking about this in my own life and my own circumstances. I’ve seen it happen personally before. I can think back to last summer, when I had been told I was at the top of my pay grade for my position and there was no hope for a raise if I wasn’t willing to change departments. But God’s will was for me to stay right where I was and to be obedient to Him (staying forward focused and not being distracted by the present facts). One afternoon, while in a drive-thru for lunch, I heard the Holy Spirit speak to me to pay for lunch for the car behind me. I did so out of obedience and keeping my focus straight ahead instead of thinking, how tight my finances already were and what the current facts around me were screaming. Not ten minutes after I made it back to work from lunch, I was called in and given a raise that I had been told before was impossible! Not only impossible, but RETROACTIVE! And God’s change didn’t stop there…just three months later, I received another promotion that could only come at the hand of God!! And as I am writing this, I am listening to a testimony at a church service, where a congregation member lost consciousness and a pulse, but as they began to pray over him and speak God’s life changing power over him, that situation changed and he was brought back from death! Even now, as my hearts deepest desire is for a spouse at this time in my life, God quickly reminded me of Adam. Adam saw all of God’s creation around him, and it was good, but none were a match for him. God took from Adam and created his helpmate, Eve. And you know how quickly that change occurred? It didn’t take months of searching through online dating – no, Adam’s change took place in the course of an afternoon nap! I know it might not be logical to think when you wake up from your Sunday afternoon nap, your helpmate will be right there waiting for you. Of course not. That would actually be a bit weird and perhaps worth calling the police over (I mean how would they get in to your house if you’re sleeping?). But it is logical to believe and EXPECT God to move that quickly to change your current circumstances! When you are obedient to God, and in the right place where He wants you at that time, the circumstances around you won’t matter because you know how quickly they are going to change – In the blink of an eye! In the time it takes to speak them in to existence! In the time it takes to activate your faith and put it to work, God’s change is going to be right there waiting for you!! So be encouraged. No matter what you are facing. If God can speak and light is… If a man can be dead, yet risen again by faith… If Adam can take a nap and wake up with a wife… What issue can you possibly think is too big for God to change instantly when you believe and put your faith and obedience in to it?! The answer – NONE!!! Let your eyes look directly forward, and your gaze be straight before you. One morning, this past week, I got in my car to go to work looking through a windshield of frozen dew droplets. I didn’t know at first that they were frozen. No, I figured that out when I went to wipe them away, halfway down the road, and they didn’t move. No big deal though; I just had to focus ahead of me, seeing past what was directly in front of me on the windshield. This got me thinking. What a great metaphor for our own lives. How often do we get so focused on what is directly in front of us that we forget to continue looking forward? It’s easy to do. Sometimes it’s nearly impossible not to give place to what we see right at that moment. What is important is that we don’t give place to what’s right there when we know our promise in God, our blessings, are still ahead of us. Think back (I know you might have to think a LONG way back) to when you were learning to drive. How many of us had a hard time learning to watch the road out in front of us instead of the road just 10ft in front? I know when I was learning I did this. I’d literally keep my focus on the road right at the end of my hood. Then I’d find myself constantly correcting the wheel trying to stay straight in the lane. My movements were sporadic and jerky, with a vehicle moving back and forth in the lane, and a parent in the passenger seat just about as stressed out as I was. When things happen in life, with circumstances you weren’t expecting, we can easily lose focus of the goal ahead of us. Our attention quickly goes to the here and now. We begin correcting and over correcting every little thing going on. We begin stressing over things we are focusing on, to the right and left, instead of focusing on the goal out ahead of us. And we lose our peace in the process of it. You keep him in perfect peace whose mind is stayed on you, because he trusts in you. Don’t stress over the small things. Don’t stress over the things you see happening now; they aren’t part of your future God has for you. You’re just passing through this valley and moving around the mountain you see. None of it is worth losing your peace over. Set your sights on things above…set your focus on the blessing God has for you. Look out and ahead to His plan, not your own. Don’t be swayed by what’s around you – be swayed only by what the Word says. Keep pushing on, friends. The scenery ahead is a lot better than the scenery around you at the moment! If you’re anything like me then you are probably thinking “how the heck did these books become so popular and mainstream? !” Well, it wasn’t their stellar writing, I’ll tell you that much. It wasn’t a great plot line either. And it definitely wasn’t the strong, female heroine in the story. No. It was the one-dimensional, bland leading lady that every woman, who has ever doubted her own self-worth, could wholeheartedly relate to. And (are you ready to tip this cow?) it’s the same reason Twilight became so popular. So, what’s wrong with that, you might ask? Well, let me tell you dear readers. I was one of those women. Yup! I read the Twilight series. Devoured is more like it. And more than once. I remember the excitement I would have when I found another friend who was reading them too. It wasn’t a secret to be reading them, but this was long ago enough that they weren’t totally mainstream yet – and it wasn’t PC to be reading about (gasp) vampires if you were a Christian. All I could think, after finishing them though, was how much I wanted to have a love like that. Every woman wants a man to come along and give her value. To make her feel like she’s the most amazing woman in the world. To make her feel beautiful. To make her feel like she is worth giving everything up for, even their own life. It’s been several since years my friend “E” and I spoke of the issues with the series Twilight. In fact, I had totally forgotten about our conversations on it until I read her post on Facebook this week about Fifty Shades of Grey. Therein lies the problem. Therein lies the greatest lie of all lies. Just as I touched on in Know Your Value, you are looking in all of the wrong places if you are waiting for a man to give you value. This void can only be filled with the true knowledge of who you are in Christ, just as “E” said above. Do you want to feel like the most important person in the world? Jesus would have died, even if it was just for you. Do you want to feel beautiful? 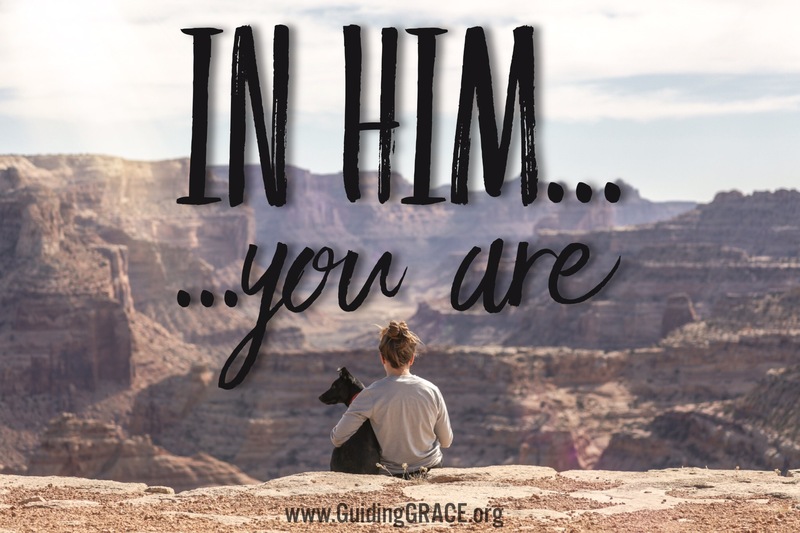 You were made in the image of God – His perfect image. Do you want to feel like you are worth giving everything up for, even giving a life for? God loves you so much, He gave the life of His only child so you could live. It is an absolute lie to believe that you aren’t worth all that God has done for you. It is a lie to believe you aren’t worthy of love. It is a lie to believe you aren’t deserving of the best there is out there. I’ll even go a step further (another underlying issue with these books – more than I want to write about today)…it’s a lie to believe the abusive, controlling, and manipulative relationship, you might be in, is all you deserve to have. It’s a lie to believe that is all you are worth. It’s a lie to believe you can’t leave because you’ll never be loved or worth anything again. YOU are worth so much more than all of that! You are worth more than what any book of fiction could ever tell you. You are worth far more than the fifty shades of lies you’ve read. Just turn to the one book of truth, the Bible, if you want to hear of Love that exceeds all expectations. A Love that is unfailing. A Love that conquers all, even death. I can remember growing up, one of my favorite songs was, Screen Door by Rich Mullins. It seemed that it was always playing on our drives from the rent house to the new house my parents were building at the time (ah, the ’80s – a moment of silence please for this great decade). As a kid, I used to laugh at the lyrics because they were so preposterous. Why would someone ever put a screen door on a submarine?! But as I got older, I realized how poignant the words really were. Faith without works is like a song you can’t sing. It’s about as useless as a screen door on a submarine. I wish I remembered who first said to me “it’s time to put feet to your faith”. It has been a statement to live by in this Christian’s life – although I haven’t always done so, I resolve to live this way from here out. Thinking back to writing about Cannonball Faith, having faith is one thing. But are you actually using what God gave you? I’ve had my ups and downs at my job over the past 10 years, and there’s been more than one occasion where I would come home set on the idea that I was going to quit the next day. But I never did. Which is a discussion for later on being in the right place, at the right time, in God’s will. But every time I’d come home and begin to gripe about the current situation, I’d be asked “What are you doing about it?” Which of course my response was always “I’m praying about it. I’m praying the right job in.” <— pretty sure that’s the adult equivalent of your child coming out of Sunday school and asking them what they learned, only to receive the ‘one-size-fits-all’ quizzical response of “Jesus?”. But you know, praying about it, and believing by faith are both great things to do…but God didn’t give us faith and the Holy Spirit to just sit around on our keisters being armchair believers – believing by faith, but not LIVING by faith – not putting works (action) to our faith. The Bible is full of examples of men and women who not only believed by faith, but put that faith to action until they saw results. Two specific examples come to mind of literally putting feet to your faith: Peter walking on water and the battle of Jericho. Matthew 17:20 speaks of mountain moving faith – speak to the mountain to move and it will move. I really wish there was an asterisk after this verse though. So many get stuck on believing and confessing that they forget to put action to it. If I could put an asterisk next to this verse it would say “Speak to the mountain to move and it will move, however, if God puts a shovel in front of you, put it to work until that whole mountain is moved.” and then refer everyone to James 2:17 that “faith without works, is dead”. This is where I think a lot of Christians get hung up with the believing and confessing part without the action part of faith. When one of my aunts received a diagnosis of cancer years ago, it was a big blow. I love her dearly and for very selfish reasons did not want to see her die – she’s my spiritual rock, my go-to, my intercessor. So I began praying about it and received my own new revelation of God’s word and the wisdom He gives us. Believing for healing is great…but you better know you’ve heard from God and have had a come to Jesus meeting before you make the decision to believe by faith ONLY. God gave us doctors, He gave those doctors great wisdom and medicine – it takes just as much faith to believe for that medication to do what it is supposed to do and for those doctors’ hands to be guided by wisdom as it does to sit back and just believe for a supernatural healing. And just because your healing came through the actions you took guided by the Holy Spirit, doesn’t make it any less of a miracle and it doesn’t make you any less of a good Christian believer for doing so! With this rhema, I drove myself up to her and sat down to ask her “Are you choosing to believe only for a miraculous healing because that’s what God has told you to do, or are you making that decision out of fear of the unknown with treatments and surgery?” When I went to see her a few weeks ago, she talked about that weekend when I came to see her several years back and as she said “preach to her and bring her back”. Which is definitely what I did. I had a boldness that weekend when I went to her and got in her face about it – I had my faith to believe for the miraculous, but I also had the guiding of the Holy Spirit in what action to take with that faith. By the way, my aunt, she’s still here….and she’s cancer free, praise God! She put feet to her faith. 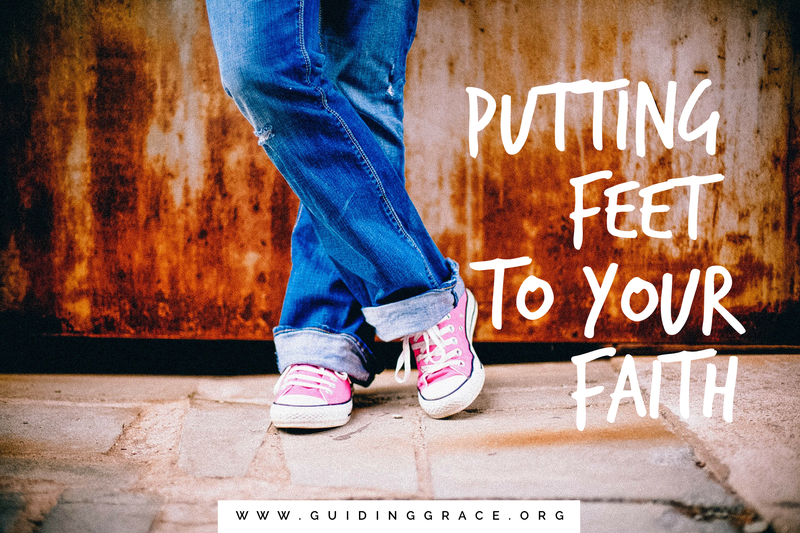 So whatever you are believing for in your life and using your faith for, are you putting feet to that faith? Are you putting action to your beliefs and confession? Or are you just going to be the armchair believer? God gave us all the same measure of faith to use in our lives. The outcome of that faith, (the substance of things hoped for, the evidence of things not seen – Hebrews 11:1) however, will be dependent on you seeking wisdom and guidance from the Holy Spirit on what action to put with your faith. If your New Years resolution was to get healthier and lose weight, you can believe, and wish, and pray for it all you want…but until you put action to it and change your lifestyle and change the way you eat and change whatever else God directs you to change, you won’t see the same results. Are you believing for a new job? Don’t just use your faith and pray about it, but seek God on the steps He wants you to take – where to begin looking, where to put resumes in, who to speak with, etc. Faith is a precious gift from God to us. Don’t let yours become stagnant and dead, having no action behind it, or pretty soon it’ll be as useless as a screen door on a submarine!